All Seasons Termite & Pest Control - wood destroying insects dietCarpenter ants are omnivorous. They eat a great variety of both animal and plant foods, including honeydew from aphids, scale insects and other plant-sucking insects, plant juices, fresh fruits, living or dead insects, other small invertebrates, common sweets such as syrup, honey, jelly, sugar and fruit, and most kinds of meat, grease and fat. Unlike termites, they cannot digest wood cellulose. They forage mostly at night. Solitary ants seen during the day are usually scouts looking for suitable food sources. Nesting SitesCarpenter ants normally build their nests in hollow trees, logs, posts, landscaping timbers and wood used in homes and other structures. Unlike termites, they do not feed on wood but merely use it as a place in which to build a nest. They prefer moist or partially decayed wood, frequently entering existing cavities or void areas through cracks and crevices. The ants usually cut galleries with the grain of the wood, following the softer parts. They leave the harder wood as walls separating the tunnels. They cut openings in these walls to interconnect the galleries. Access to the outside may be through natural openings, or the ants may cut openings where none exist naturally. Occupied galleries are kept immaculate. Shredded wood fragments from the excavations are carried from the nest and deposited outside. Cone-shaped piles of these fragments sometimes build up beneath the “windows” or other nest openings. The piles may also contain inedible parts of insects from their diet, bits of sand or soil, dead ant bodies from the colony, and gener-al debris. This “sawdust” or “frass” is not always visible, because ants may dispose of it in hollow parts of trees, void areas in structures, or unused galleries in the nest. Carpenter ants are omnivorous. They eat a great variety of both animal and plant foods, including honeydew from aphids, scale insects and other plant-sucking insects, plant juices, fresh fruits, living or dead insects, other small invertebrates, common sweets such as syrup, honey, jelly, sugar and fruit, and most kinds of meat, grease and fat. Unlike termites, they cannot digest wood cellulose. They forage mostly at night. Solitary ants seen during the day are usually scouts looking for suitable food sources. Carpenter ants normally build their nests in hollow trees, logs, posts, landscaping timbers and wood used in homes and other structures. Unlike termites, they do not feed on wood but merely use it as a place in which to build a nest. They prefer moist or partially decayed wood, frequently entering existing cavities or void areas through cracks and crevices. The ants usually cut galleries with the grain of the wood, following the softer parts. They leave the harder wood as walls separating the tunnels. They cut openings in these walls to interconnect the galleries. Access to the outside may be through natural openings, or the ants may cut openings where none exist naturally. Occupied galleries are kept immaculate. Shredded wood fragments from the excavations are carried from the nest and deposited outside. Cone-shaped piles of these fragments sometimes build up beneath the “windows” or other nest openings. The piles may also contain inedible parts of insects from their diet, bits of sand or soil, dead ant bodies from the colony, and gener-al debris. This “sawdust” or “frass” is not always visible, because ants may dispose of it in hollow parts of trees, void areas in structures, or unused galleries in the nest. Carpenter ants are social insects that live in colonies, primarily in wood. They hollow out wood to build their nests, making their galleries and chambers velvety-smooth as if a carpenter had sanded the surfaces. 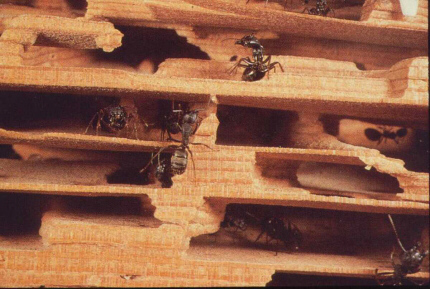 Their tunneling in wood and foraging for food and water lead to their “pest” status in or around homes. Carpenter ants are an excellent indicator of moisture problems in a building, or other condi-tions conducive to their infestation, such as rot-ting wood, that need attention. 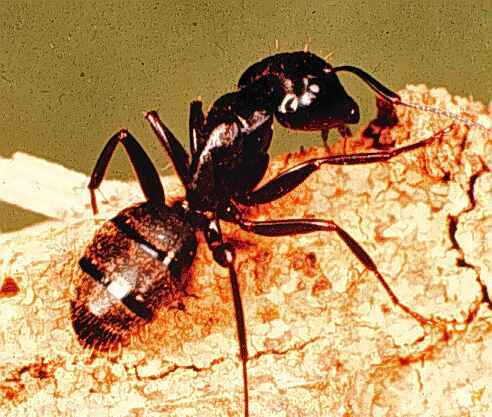 Those of economic importance as wood destroyers belong to the genus Camponotus, with 14 species occurring in Texas. Homeowners can minimize damage to their houses from carpenter ants by learning how to identify the ants, knowing their nest site preferences, and taking proper preventive and control measures. Carpenter ants are among the largest ants in the United States. Adults vary in length from about 1 /4 inch (6 mm) for a minor worker, to 1 /2 inch (12 mm) for a major worker, and up to 7 /16 inch (18 mm) for winged reproductives. Each colony has one functional, wingless queen, 9 /16 inch (20 mm) long. The ants develop through several stages in their metamorphosis: egg, larva, pupa and adult. All stages can be found in a colony, but identification is made from the adults, which are the familiar ant-like insects with 6 legs, 3 distinct body regions with a constricted waist, and prominent elbowed antennae. These ants vary from a solid dull black or yellowish-red to a combination of black and dull red or reddish-orange. Carpenter ants have only one segment or node between their thorax and abdomen, a circle of hairs at the tip of their abdomen, and an evenly rounded thorax when viewed from the side. Winged carpenter ants resemble winged termites and, in Texas, it is not uncommon for both of these important wood-destroying insects to swarm at about the same time. It is vital that they be identified accurately, because control measures differ greatly for the two insect groups. Ants have small, constricted waists; wings of unequal length, with the front pair longer than the hind pair; and antennae bent at right angles about mid-length. Termite bodies are not narrowed at the middle; their wings are of equal length; and their antennae are rather straight with bead-like segments. 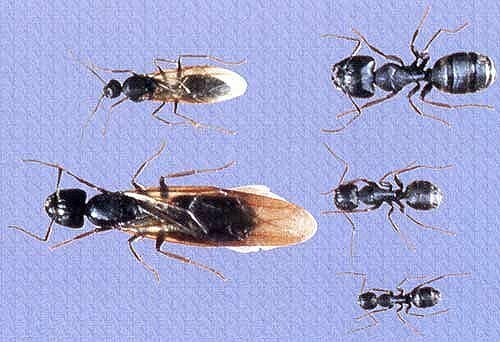 Mature carpenter ant colonies produce male and female winged reproductives from early spring to summer. Environmental conditions trigger their emergence, which may occur over several days or weeks. Mating occurs in flight, called a nuptial flight, after which the males die and the females begin searching for a nesting site. The new queen breaks off her wings either just before or after choosing the nesting site. After establishing the nest, the female deposits 15 to 20 eggs. Under favorable conditions, the eggs progress through the larval and pupal stages and into the worker stage in about 2 months. The queen cares for the initial larvae and feeds them with fluids secreted from her body. After becoming adults, these new workers expand the nest as the colony population increases, excavate galleries, and provide food for the queen and the new brood (egg, larvae, and pupae). 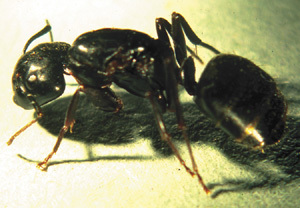 The first-generation worker ants are small. They regurgitate food to nourish developing larvae. Older larvae are fed solid food; they feed partially digested food to the queen. The queen produces eggs for the rest of her life. The colony remains small during the first year, but in later years it grows rapidly, up to a maxi-mum of 2,000 to 3,000 ants. It usually takes 3 to 6 years for a colony to reach this size, at which time winged reproductives are produced. Upon reaching its mature size, the colony rarely grows larger, but workers are produced continually to replace ones that die or are lost. A mature colony produces 200 to 400 winged individuals each year. Production drains colony resources, keeping ant numbers down. Winged reproductives usually develop in late summer, overwinter in the nest and swarm in spring and early summer. Keep exposed wood in good condition, with all cracks, knot holes, checks, or joints properly sealed with wood putty, and all surfaces painted. The key to successfully managing carpenter ants is to identify all locations where a colony could exist. Inspect the structure thoroughly, both inside and out. Carefully examine the areas listed above for signs of carpenter ants. Conical piles of shredded wood debris are an excellent indicator of a nest site. Treat carpenter ant nests with a residual insecticide applied either as a dust or spray. You may need to drill small holes into wall voids, window and door sills, baseboards and other areas to reach the nest or major part of the colony. 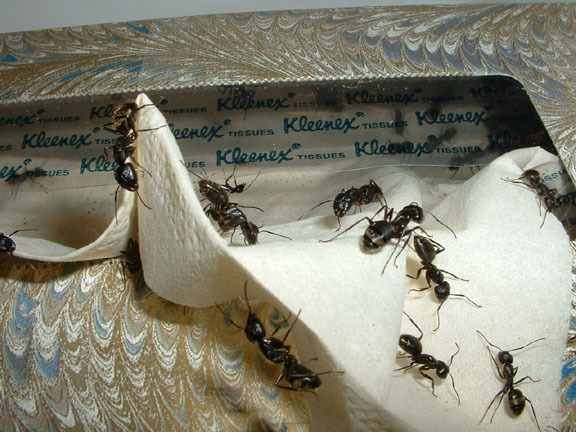 Dust formulations are particularly effective, as the ant activity tends to spread the dust throughout the colony.